MOSCOW, Russia -- Vladimir Putin is seizing on mixed signals from the U.S. to quietly tighten Russia’s grip on two rebel regions of Ukraine, burying hopes for a European-brokered peace deal and relief from sanctions anytime soon. While the Kremlin continues to publicly back the accord that Germany and France oversaw in 2015, Putin’s real strategy in Ukraine is to fully separate the two border areas known as the Donbass through incremental integration with Russia, three people close to the leadership in Moscow said. He has no plans to recognize or annex the territories, they said. Russia has been moving gradually, using a blockade by Ukrainian activists as political cover to take over key economic links with the separatist zones. Last week, Russian Railways slashed rates for shipping coal and iron ore to points near the rebel areas, where the metals industry provides most jobs. That will allow Russia to replace Ukrainian supplies halted by Kiev and ensure that steel plants continue to function, according to two people in the industry. “A step has been taken toward detaching Donbass -- there’s no doubt about that,” a senior lawmaker in the ruling United Russia party, Konstantin Zatulin, said by phone from Moscow. Like other officials, Zatulin blamed Ukraine for forcing Moscow’s hand through the blockade, an allegation Kiev rejects. Zatulin’s assessment of the Kremlin’s plans was confirmed by Alexei Chesnakov, a former Kremlin staffer who now advises Putin’s administration on Ukraine policy, and a senior government official who asked not to be identified. Kremlin spokesman Dmitry Peskov Thursday dismissed the idea that Russia is integrating the regions, calling it “absurd” and “naive” on a conference call with reporters. Earlier this year, Putin angered his Ukrainian counterpart, Petro Poroshenko, by signing a decree recognizing passports and other documents issued by the separatist governments in Luhansk and Donetsk, which have already declared the ruble their official currency. The Kremlin is also considering making it easier for the 2 million residents of the regions to become Russian citizens, which would dramatically complicate any attempt by Kiev to reassert control. Moscow is implementing the so-called “Transnistria scenario,” according to the deputy head of Poroshenko’s administration, Kostiantyn Yelisieiev, referring to the breakaway region in the former Soviet republic of Moldova, which hosts Russian troops but has no citizenship agreements with Russia. 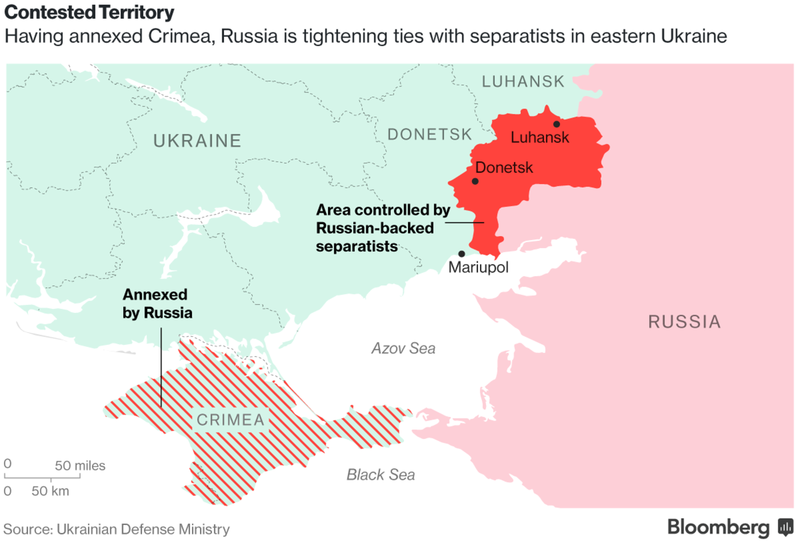 Russia supports a string of separatist regions in former Soviet republics, using them as leverage over pro-Western governments in what it considers to be its sphere of influence. In 2008, Russia sent troops into Georgia to secure two such areas that are now essentially Kremlin protectorates. Last month, Russia absorbed some of the militias there into its regular army. “We don’t have peace for one reason: Russians are not interested in reaching peace,” Poroshenko said in a speech in London on Tuesday. Putin’s moves in Ukraine pose a challenge to the U.S. and the European Union, which publicly support the 2015 Minsk accord that calls for Ukraine to regain control of the Donbass. A collapse of the deal would be a major blow to German Chancellor Angela Merkel, who’s spent a lot of political capital trying to end the worst violence Europe’s seen since the the Balkan wars of the 1990s. The three-year conflict has killed 10,000 people and displaced 2 million more. President Donald Trump’s administration, on the other hand, has sent mixed signals on its stance and even appears to be “totally uninterested” in the conflict, as one senior Russian diplomat put it. Trump has taken a tough line rhetorically, though he hasn’t made his position clear and the White House seems focused on issues it considers more pressing like Syria and North Korea. While Secretary of State Rex Tillerson has questioned Ukraine’s importance for U.S. taxpayers, he’s also insisted that sanctions be maintained on Russia until the Kremlin respects its commitments to restore peace. Previously, the new U.S. administration had only pledged to keep the less onerous penalties that were imposed in response to Putin’s annexation of Crimea. Putin’s strategy involves developing levers that can be used to strengthen the Kremlin’s control over the Donbass on short notice, two Western diplomats in Moscow said, an assessment confirmed by former Russian officials. Retaliatory measures “are always ready,” said Chesnakov, the Kremlin adviser on Ukraine. In January, Ukrainian nationalist war veterans blocked off cargo links with the rebel-held east. Two months later, Poroshenko formalized the blockade even though it’s costing his country’s economy about 1 percent of output because of the cut-off of key raw material supplies including coal. Poroshenko has said the ban on trade will be lifted once separatist authorities reverse their seizure of Ukrainian enterprises. Donetsk and Luhansk in March took control of about 40 Ukrainian companies, including billionaire Rinat Akhmetov’s steel-making and electricity assets. This reflects the financial component of Putin’s policy, according to Andrey Margolin, an economist at the Presidential Academy of National Economy and Public Administration. “Now we see that integration with the Russian economy is growing,” creating benefits that help offset the expense of subsidizing the separatist regions, he said. “The less this economy is integrated with Russia’s, the higher the costs,” Margolin said. With the Minsk accord now basically at a dead end, the Donbass is drifting into a frozen conflict that may last decades. As for Poroshenko, his hands are tied, just as Putin likes it, according to Volodymyr Fesenko at the Penta research institute in Kiev. Domestic opponents are preventing Poroshenko from granting wide autonomy to the rebel regions, as required under the peace agreement, while two other contentious issues mandated by the accord -- a full cease-fire and a return of border areas to Ukrainian control -- are also no closer to being fulfilled. “This lets Russia strengthen its hold on the two republics,” Fesenko said.